30 writing prompts for children to use when creating imaginative texts. Ideal to use as an independent writing task. Children pick a prompt from the jar and write an imaginative text based on the prompt. Print and cut each writing prompt into strips. For repetitive use, laminate each strip. Place all the writing prompt strips into a jar. Put the writing prompt jar in the writing corner in your classroom. 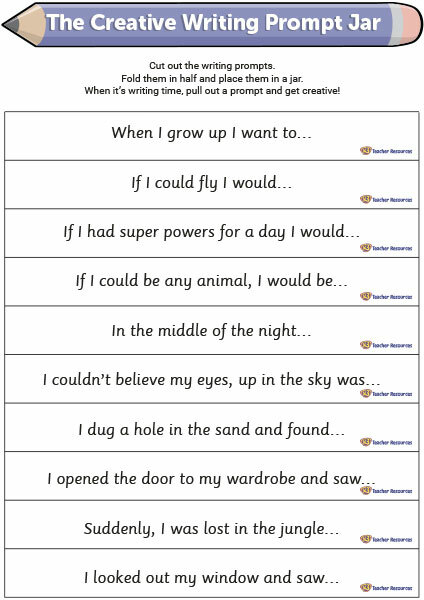 Encourage the children to pick a writing prompt from the jar as an independent writing task. What comes next? – Invite confident children to share their stories with the class or choose a prompt to create a join construction.